09:59 wsmoak Pines looks different! I remembered the Firefox search widget and tried to install it... didn't *seem* to work. 10:00 wsmoak Turns out that it did install, it's just using a plain magnifying glass icon that I didn't recognize as Pines. Maybe you could use the little tree icon? 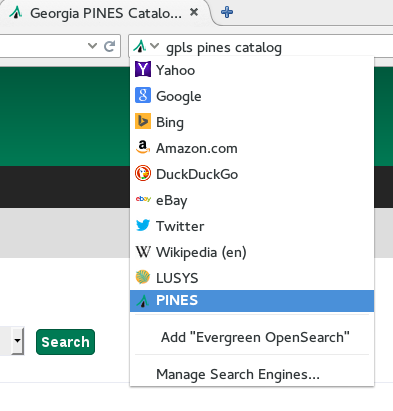 10:02 wsmoak The tree is there next to "Add Evergreen OpenSearch", but isn't used in the 'Search With' options later. 10:15 pinesol_green jeff: The operation succeeded. 10:24 wsmoak I couldn't catch the hover text in the screen shot, but that grey magnifying glass is actually PINES. 10:29 dbs what browser are you using? 10:30 dbs specifically Firefox 35.0 for Linux here. 10:30 wsmoak Firefox 35.0 . So your search drop down doesn't look like my screen shot above, you get your icon under "Search for xyz with:" ? 10:31 dbs Yep, mine looks quite different. You running a non-stock theme or extension perhaps? 10:31 wsmoak I don't think it's using favicon -- I see the tree up in the browser tab next to the site title. 10:33 wsmoak will be interesting to see what another osx user sees. Norton might be to blame, it sticks its nose where it isn't wanted all the time. 10:34 wsmoak anyway... the search works fine now that I know what I'm looking at. :) minor issue. 10:58 * dbs peers at egweb: Context Loader error: Can't use an undefined value as a HASH reference at WWW/EGCatLoader/Browse.pm line 271. 11:00 dbs suggests its a database error, and the there's no $self->editor->event member that was returned I guess. 12:12 dbs even weirder, that browse works on our test instance where we haven't reingested all of the records. hrm. 12:37 Dyrcona It's always acq. 12:37 Dyrcona But then, I'm "off" today. 12:47 julialima_ Hello evergreeners!!! The web client is not working, at least for me. In the patron search I can´t perform any search, I have no feedback so I don´t know what is going on. Anyone know if there is a problem? 12:47 bshum Dyrcona: I've seen that too actually. 12:51 bshum julialima_: I'm probably not the best person to answer you (I'm not sure how many folks have off today in the US). Anywho, which server are you using to test with? 12:52 dbwells julialima_: Some folks might be at lunch, which is where I am headed. Also, just to clarify, are you talking about webby.evergreencatalog.com, or some other test site? 13:37 abowling hey, all. have another noob question that i think i have the answer to: does search_prefs.xul run on a user's local machine? 13:57 dbs anyone else care to share what their memcached memory is set to? 13:58 abowling dbs: thanks. i thought so, but wanted to confirm after editing a file in the wrong place last week.